The wanted man whose face you may have seen on area billboards, was captured by local officials, Wednesday. Lamar Advertising Company displayed the wanted notice on its digital billboards in Erie, Pittsburgh and Harrisburg. Lamar's billboards featured a photo of the suspect and advertised the reward that the FBI was offering for information leading to his location and arrest. Lamar has an Emergency Alert System in place, which allows FBI and other emergency alerts to be distributed on a local, state or national level. Erie man, Ricky Pullium, was arrested by Erie Area Gang Law Enforcement, U.S. Marshals, Fugitive Task Force officials and the Safe Streets Task Force. Pullium was wanted on a charge of possession of a firearm, by a convicted felon. The incident stems from a multi-agency raid we first told you about back in February, at 'Up The Way Bar and Grill', in Erie. The arrest comes just 11 days after Pullium's face went live on billboards, across town. 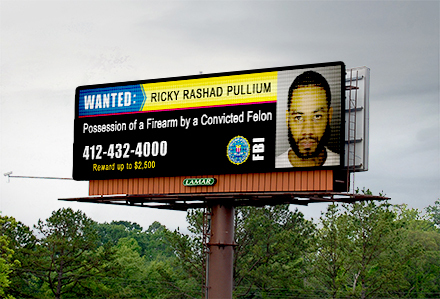 FBI officials said they received multiple tips on Pullium's whereabouts based on the billboards, alone. Lamar Advertising Company (Nasdaq: LAMR), a leading owner and operator of outdoor advertising and logo sign displays, announces the Company’s operating results for the first quarter ended March 31, 2015.